The original design of the building’s cladding was so flawed that the cladding became structurally unstable, requiring complete re-cladding. Extremely flawed design of the brick veneer cladding caused widespread and severe cracking, anchor corrosion, and other serious problems, compromising the cladding’s structural stability. The new brick veneer cladding contains proper expansion joints and copper sill caps per PL:BECS recommendations. The PL:BECS report provided detailed, color-coded maps of all problem locations. Seriously-flawed design of the cladding, combined with improper material selections, caused widespread and severe corrosion of the brick veneer anchors, compromising the cladding’s structural integrity. PL:BECS goes to extremes on its client’s behalf. Project Summary:	This 1970’s era psychology building consisted of a cast-in-place primary structure clad with a brick veneer. Its exterior cladding displayed numerous problematic symptoms, including severe cracking, moisture degradation, and buckling. PL:BECS Services:	Services were provided in two phases separated by a decade. In the first phase, PL:BECS performed a detailed evaluation of the building’s exterior brick cladding and windows. 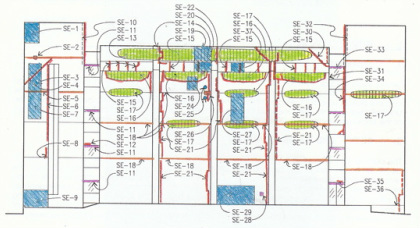 Services included a detailed visual examination, non-destructive evaluation of masonry anchor densities, masonry absorption testing, and infiltration detection, as well as surgical openings in the cladding to examine supporting ledgers, flashings, veneer ties, and other components of the building’s exterior envelope. This first-phase effort culminated in a detailed report summarizing findings and problems, analyzing their causes, and outlining detailed corrective recommendations. The investigation revealed that the brick veneer cracking and degradation reflected a multitude of design errors. 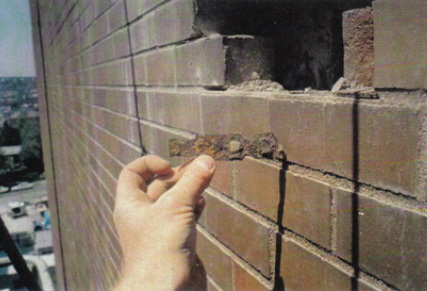 Absence of expansion joints resulted in extensive cracking of the brick cladding. Sloped brick elements allowed severe infiltration into the cladding, leading to corrosion of veneer ties, compromising the cladding’s structural integrity. In addition, the cladding was plagued by numerous installation deficiencies, which included inadequate veneer tie densities, inadequate securement of the relief ledgers, deficient flashings, and many other flaws. PL:BECS concluded that the combination of widespread flaws made replacement of the brick cladding the most feasible, though costly, corrective approach, and provided detailed recommendations for how this should be achieved. The second phase of PL:BECS services occurred a full decade later, and consisted of providing SHKS Architects with detailed guidance in the design of the building’s total re-cladding effort. 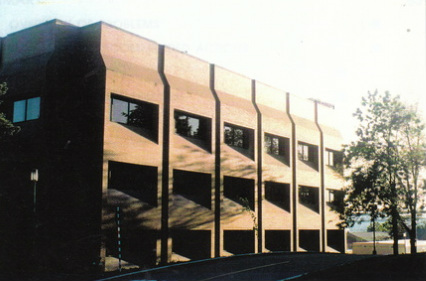 The newly-designed cladding incorporated proper joints to accommodate movement, sheet metal roof sections over all sloped elements and proper flashings to preclude infiltration, drainage mats to avoid mortar-clogging of the masonry cladding and allow drainage and venting, as well as added rigid insulation to enhance the building’s energy-efficiency.